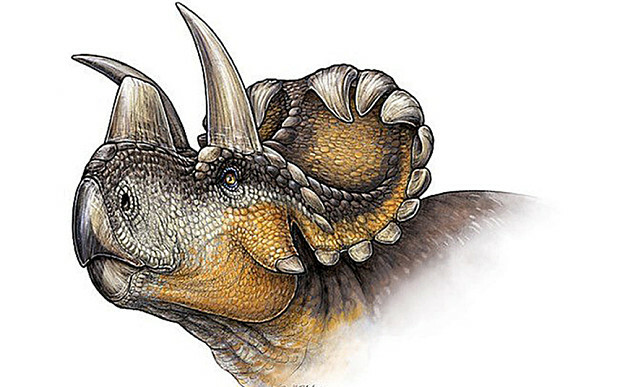 A newly-named dinosaur whose head frill was adorned with curly horns has joined the ranks of the legendary family that includes the Triceratops, paleontologists said on Wednesday. The lumbering creature is named Wendiceratops pinhornensis, after the fossil hunter Wendy Sloboda, who first discovered the trove of some 200 bones in southern Alberta, Canada, said the study in the journal PLOS ONE. The plant-eating dinosaur lived about 79 million years ago, weighing more than a ton and measuring about 20 feet long. In all, more than 200 bones were collected from the Oldman Formation of southern Alberta, near the border with the US state of Montana, in 2011. Paleontologists said the bones belonged to three adults and one juvenile.